It’s impossible. To pick without tasting. That’s what we’ve done for two weeks. Pick and taste. As we hauled in bowl after bowl of apricots from our backyard tree. So many orange orbs. Flushed red and gently kissed by the sun. You can fit three into your palm when standing on the ladder. And when you find a perfectly ripe one that pulls off the stem with the tiniest bit of resistance, you can’t help yourself. You peel it apart, toss the stone, and take a bite. We halved them for snacks, dried them for later, and blended them into freezer jam. These were dried in my mom’s old dehydrator. Took about a week. But they’re soft, chewy, and we’ve been eating them like candy. There is a special kind of satisfaction in using what the land offers you. It has been equally satisfying to share with family and friends. We left the ladder up for anyone to come and pick. Elizabeth came. My Dad. My sister. My aunt and uncle. Even the deer came. Daily. To eat the fallen fruit. They are surprisingly skilled at devouring the flesh and leaving the pit. We picked this bowl for Lori across the street, who made three batches of apricot jam last week. And became a grandmother. And sent her youngest off on a spanish speaking mission. All joy. Summer has been flying by. We’ve been day-tripping, reunion-ing, swimming, reading Narnia chronicles in our little chairs, scooping ice cream cones, trying new recipes for dinner, watching movies, enjoying slow mornings. This might be our best summer yet. With the kids old enough to make their own sandwiches and swim without supervision. The pace of it has been about right. We are so happy to be in our new home, to work in the yard, stretch out, and know this is where we will stay. I snapped the above photo one evening while picking apricots. Because I love looking in. Don’t you? Especially this time of night. Window panes glowing, kids moving in and out the back door. Each bowl brims like a confirmation to me. A reminder of the abundance of life. And a gracious God, willing to share all he has. We will pick the last of the fruit today. And make apricot leather. As for jam recipes, I can’t decide which flavor I like best. We made plain freezer jam (recipe in the Sure-Jell packet). Always good. We made Apricot Almond freezer jam. Loved this recipe from Bountiful Kitchen. And next year we will try Aunt Leslie’s Apricot Pineapple. If you make the Apricot Almond, I recommend only 1 tsp. almond extract. Two hides the apricot flavor. And don’t worry if the jam seems runny. It should be. All this goodness bottled up. Everything is sweeter when we give it away. Love. Light. Our time. Although I live in CA and think the best produce in the world is here, I must admit that Utah has some of the best stone fruit anywhere. The Bing cherries that are ready for Independence day, the Elberta Peaches and the apricots are another reason that summer is the most wonderful time of the year in Utah. 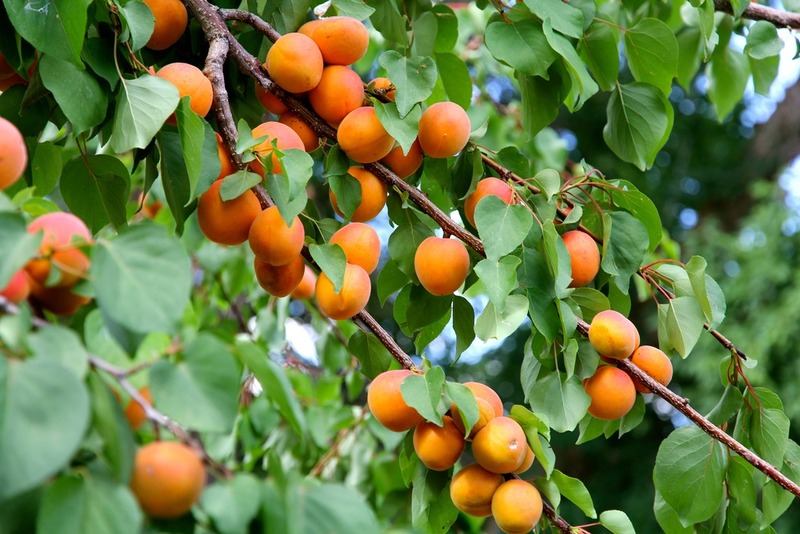 Enjoy every one of those apricots…what a bonus in your new home! Apricot pie is what summer is all about! Love this so much, Cath. Can we be neighbors? Your harvest is beautiful in all the ways. Drought here in CA means our apricot didn't produce much, but I am happy to be reminded the drought isn't everywhere!